Nuu-chah-nulth culture displayed in D.C. The sound of pounding drums and Nuu-chah-nulth songs echoed through the grand entrance at the National Museum of the American Indian. Fisheries and Oceans Canada (DFO) has shut down all commercial harvesting of herring, herring roe, and spawn-on-kelp because of projected low returns of West Coast Vancouver Island herring. Imagine classrooms full of children smiling, excited, jumping up, shouting, and being happy. The Bank of Montreal donated $2000 to the Tseshaht First Nation’s totem pole project. The donation will go toward the construction of a concrete foundation, landscaping and signage for the two poles. A five-year project to rehabilitate local abalone stocks is in jeopardy because of legal interpretation of the Species at Risk Act (SARA) by Fisheries and Oceans Canada (DFO). Having to fight the BC Ministry of Children and Family Development (MCFD) for the past 25 years has taken its toll on Ellery Cootes Sr. and his wife Sarah. Large halogen lights shine across the Fisherman’s Wharf and over the water beside the Alberni Quay as hundreds of Tseshaht and Hupacasath fishers sell their late-night Chinook catches to waiting buyers. The annual Choo-Kwa Challenge canoe races were held on Saturday, August 27th and ended with the Ucluelet Canoe taking top spot. First Nations people in this small coastal city are complaining of racial profiling, and of abuse at the hands of the local RCMP. 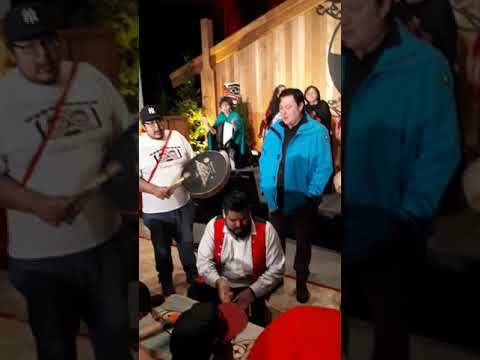 After months of trying to contact Dr. Richard Ward, the Oxford professor has finally responded, saying he is willing to do whatever Nuu-chah-nulth want done with their blood. For the hundreds of Nuu-chah-nulth people suffering the debilitating effects of arthritis, Dr. Richard Ward’s groundbreaking study in the early 1980s was like a beacon of hope.